"Flag of the Socialist Republic of Macedonia 1946-1992"
After the Second World War, the Vardar part of Macedonia was given a status of a federal republic, in the border of Yugoslavia. The Macedonian flag was chosen during a meeting of the Anti-Fascist Assembly for National Liberation of Macedonia, on December 31th, 1946. "Flag of the Republic of Macedonia 1992-1995"
The second flag of Macedonia. After it's independence from SFR Yugoslavia, Macedonia changed it's flag into the flag of the ancient Macedonian dynasty. The 16 pointed sun star, became official Macedonian flag with the yellow and red fragments. Due to the Greek propaganda (which was activated in early 1980), and after an economic blockade of the Macedonian borders, the Macedonian flag was changed in September 1995. Soon, the Macedonian Assembly has approved changes to the Macedonian flag, a move to opens the borders to neighboring Greece to end the clipping economic blockade imposed on Macedonia in period of 18 months. The Macedonian Assembly voted 110 to 1 to approve a new flag that is acceptable to Greece. The yellow and red colors are retained, but the 16 pointed Sun of Vergina (the symbol of the Macedonians) that Greece claimed that is Greek symbol has been removed. 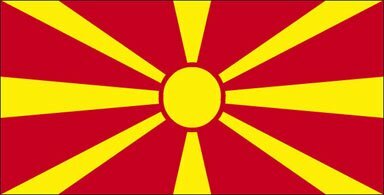 The 16 pointed sun was removed from the flag of Macedonia, but it still retains it's role - flag of the Macedonian Nation, and is used everywhere by Macedonians world-wide side by side with the National flag of Macedonia. 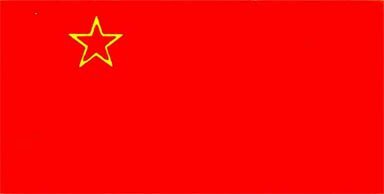 "Flag of the Republic of Macedonia since 1995"
The new Macedonian state flag has stylized eight - ray sun spreads over the length of the flag. As a result Greece stop the blockade on it's borders with Macedonia.